The game is an �engine-building� style game in which players construct �Contraptions� to extract Power from four nested universes called Rickverse, Microverse, Miniverse, and Teenyverse. Players can move between the ��Verses� to take advantages of the Power available in different places and to construct Contraptions. The smaller �Verses allow players to take more actions each turn, but the Contraptions they build there are less reliable, and Power flows �upwards� toward the larger �Verses. 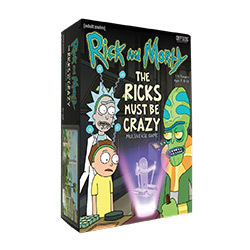 The Ricks Must Be Crazy includes 60 cards, 44 tokens, 4 �Verse tiles, 4 oversized character cards, and 4 character stand-ups. The game is intended for 2 to 4 players, ages 17 and up. MSRP is $19.99. The Rick and Morty show has proven to be fertile ground for Cryptozoic, which released two titles based on the show this year and two last year (see "New �Rick and Morty� Games, �Crossover Crisis Animation Annihilation�").